Study and pass the ROC-A exam. This stands for the Restricted Operator Certificate with Aeronautical Qualification, and covers a number of important topics. These include the ITU Phonetic Alphabet, transmission standards, procedural rules, and other important messaging. 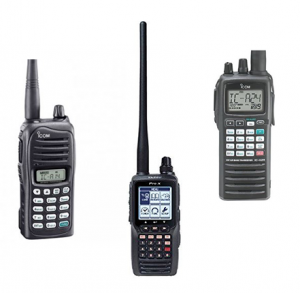 Purchase an aeronautical (VHF) radio. There is a wide selection of radios to choose from that will meet your needs when operating UAVs, so you don’t need to break the bank on one. iCom and Yaesu are two big players in the market, with both of them offering various pricing tiers… you don’t need anything fancy here. Write a script to assist you. In addition to gaining experience by transmitting regularly on the radio, consider writing out a script that is relevant to your UAV operations. In your messaging, be sure to include: (A) Drone identification e.g. Uniform Alpha Victor (B) Proximity to the nearest aerodrome or known landmark, in nautical miles (C) Your activity on site, e.g. Performing aerial surveyand (D) Your operating altitude, in feet. By writing a script it can help some to get over “mic fright”, and even for those comfortable on the radio, there’s less chance of a miscommunication. Make a habit of knowing your local frequencies. I’m still looking up new frequencies when we operate our UAV in new areas, but I’ve started to memorize the local frequencies that we operate on. The Canada Flight Supplement (CFS) can assist here, or you can check website such as SkyVector if you’re searching for mandatory aerodrome frequencies (when you’re operating within 5 nautical miles of an aerodrome). When you’re operating within a control zone, you will be required to call the tower before and after your planned flight, and it’s more important to monitor the radio than to transmit in those occasions. When you’re in Class G airspace (uncontrolled), for example, it’s more useful to stay on top of your radio communication. Communicate at regular but reasonable intervals. When you’re outside of a control zone, it’s common to transmit prior to takeoff, but I’ve found that it’s quite valuable to also communicate at 10 minute intervals during a mapping mission, for example. There may be local traffic that come into your area that were not anywhere near you 10 minutes previous. There are times when you transmit on the radio, but local pilots have not yet switched over to your frequency. While communication is important, it’s also crucial not to flood the airways with frequent chatter. A few examples of aeronautical radios on the market today. Remember that it is a primary responsibility of the UAV pilot to give way to manned aircraft at all times, but radio communication is an important secondary step to mitigate risk. In addition to VHF radio procedures, the other key communication piece involves notification to NavCanada as discussed in this post, and landowner permission for takeoff and landing. By adding the aeronautical radio to your standard field kit, you can improve safety, maintain peace of mind, and operate your UAV in a professional manner. Here’s to safe and successful flights!